You are riding on a curving, two-lane road. You are traveling just below the speed limit. You round a right-hand curve and feel your bike begin to drift outward, with your wheels almost touching the center line. Suddenly, an oncoming car appears, straddling the center line. You feel like a deer caught in the headlights. What would you do? Many riders freeze up in this situation. 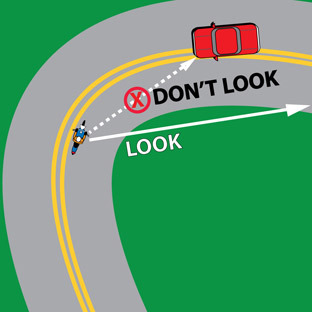 They incorrectly roll off the throttle and stare at the oncoming vehicle … and do little else. Also known as target fixation, it can easily lead to disaster: The bike tends to go where you look. The best response is to hold the throttle steady, focus your head and eyes where you want to go – the turn’s exit, not the oncoming vehicle! – and lean the bike harder by counter steering (pressing forward on the inside hand grip) and tightening your line. Running wide in a corner is the most common cause of motorcycle fatalities. Even experienced riders fall into this trap if they’re not looking far enough ahead. 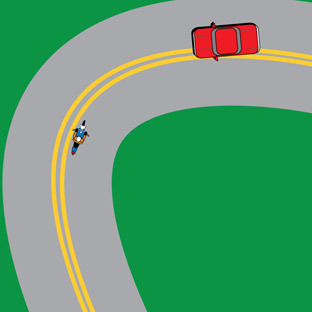 It doesn't matter whether it's an oncoming car, a tighter turn than the rider expected or some other obstacle. When a rider suddenly decides they’re not going to make it, they often panic, look down and forget to steer through the turn. When the road surface is good, a motorcycle traveling at the speed limit should be able to negotiate any curve – as long as the rider stays steady on the gas, looks through the turn and counter steers to control path of travel.